It’s finally that time again! We know, it’s been a while, but today we have another interview from the category #WorkersWednesday for you. 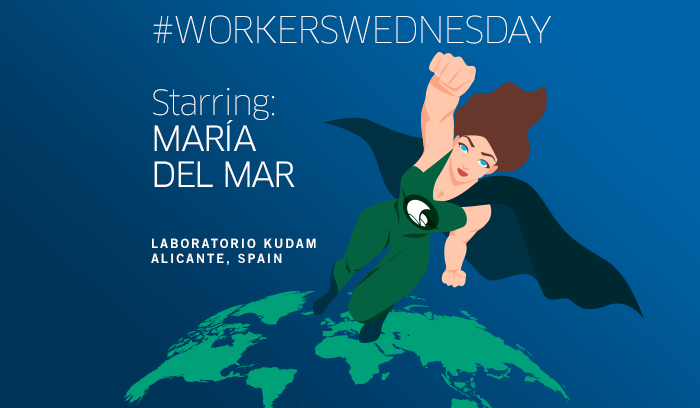 Today we would like to introduce you to María del Mar from Laboratorio Kudam in Alicante, Spain. She is the Head of Administration here. 1. Please introduce yourself briefly and tell us in which department you work. I work in the administration department of the Kudam Laboratory. There, I pass on financial information to the financial department of the Tentamus Group in Spain. I also create invoices, revise and send analysis reports to clients and, with the support of my colleagues, take over the daily tasks in the laboratory Kudam. 2. How does your daily workday look like? 3. Can you remember your first week here? How did you find it at your new workplace? It’s been so long…. (more than 21 years ago), but I remember a small business in a very small place and it is very satisfying to see how much we have grown. Revision of reports and settlement of accounts with banks. 5. What would you tell potential applicants? I would say that they should become part of our group and therefore have a great future perspective. And of course that they should enjoy their work. 6. What superpower would make your work more enjoyable? I would like to be able to split myself so that I can be in multiple places at the same time.